Ian D'Sa and Aaron Solowoniuk of Canadian punk-rock outfit, Billy Talent sat down with Alter The Press! prior to their headlining show at London's Brixton Academy. The guys spoke to ATP! about their success in Germany, their latest release 'Billy Talent III', the band on still not making an impact on the US market, touring plans for the next year, and more. Ian D'sa (guitarist): It's been awesome. It's been two years since we've done a full UK tour. We had to reschedule the first few days because Ben lost his voice a few days before we were supposed to play Leeds and Nottingham, probably because we played an outdoor show in Toronto the week before and we were all wearing t-shirts. Bad idea! Aaron Solowoniuk (drums): Dublin was pretty good. ATP: How does it feel that you are officially bigger than bands like Green Day in Germany? Ian: It's weird, we don't think of it like that but it's pretty crazy. Aaron: We are just in this mindset right now, of playing live shows everywhere we can. To be able to play Brixton Academy is unbelievable to us but then to roll into Germany and play giant 10,000 seat venues is nuts as well. 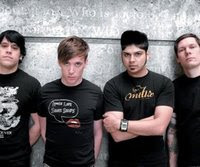 ATP: What do you think German fans get about Billy Talent that no one else does? Ian: I think the reason we are more successful in Germany is because we tour a lot more there. We did a lot of touring there in the early days and really built a fan base by playing the small clubs. I think we spend more time in Germany and Canada then most places because, originally, things were happening more quicker there. ATP: How did it feel to be offered to headline Rock Am Ring (huge German Festival) this year? Ian: Our new album wasn't out yet so we didn't want to headline. It's the kind of festival you need to play a few times before you get to headline; that was only our second time. I feel like we are at the level to headline to now. Aaron: We went on before Limp Bizkit.Iit was amazing seeing Fred Durst getting the sea of fans to wave their hands back and forth in the air. ATP: Why do you think Billy Talent hasn’t cracked the US market yet? Aaron: We've had a lot of love from the UK, German and Canadian record companies, we are friends with people who work there and they really enjoy our band. We never made any relationships like that in the US. Ian: We unfortunately signed to a label which we thought was a rock and roll label, which used to have bands like Led Zeppelin, when we got onboard, they were cutting down their rock band roster and putting all their efforts into their R'N'B roster, so the label pretty much turned into an urban label. We were pretty much this one weird band on this label. They never put our records in stores, we never did any press when headlining shows; I think that's a major part of the reason. We did plenty of touring there, we did Warped Tour, opened for My Chemical Romance, Rise Against etc. Now we are at the stage and finally happy with our new label, Roadrunner Records, who specialize in rock and metal. ATP: You say this, but your album didn't get released till September this year. Ian: It was because we were in the middle of renegotiating with labels and it was all politics. We did a headline US tour in September, doing small clubs, because it was awesome to see the real fans there and see how much we've grown. ATP: How does it feel, playing these huge headlining shows in Germany and then going to the US to play small clubs? Ian: It's a whole different world, you feel more appreciated in a place like Germany, to play these massive festivals and people coming out to see you. But when you go back to the US, the mindset isn't having to playing crappy small clubs, we can't wait because we want to impress people and convert them into Billy Talent fans. Aaron: You can get the same feeling from playing a huge festival that you get playing a packed club. Ian: We actually had British and German fans fly to the US to see us in these small clubs. It was amazing for them, as they had never got to see us in such a small environment before. ATP: 'Billy Talent III', how would you compare it to your last two albums? Ian: The songs are more heavier, kind of a more 90's rock sort of feel. There's not as much angst as the first record but there’s still the same classic Billy Talent sound. We tried doing riff-rock, which we never did before, and as far as lyrically, it's similar to the last album but a little more darker. We wanted to try something different and not to do the same thing over again. Aaron: It's fun to play these songs live, it's cool to pick songs from all three albums and put together 16-18 songs and see the reaction from the fans. ATP: Some great bands have come out of Canada. Alexisonfire, Cancer Bats, Fucked Up etc. Is there anyone the world is missing out on? Ian: It's amazing to see bands from Toronto get big internationally. Die Mannequin are a band who I produced a few songs for, for their EP, who are getting some notoriety. Ian: Still Life Still, who Kevin Drew, of Broken Social Scene, produced. Flash Lightnin' are incredible musicians and an awesome band. ATP: You’re off to tour with Alexisonfire in Canada next year. How did this happen? Aaron: We just wanted to build our dream tour in Canada. Our first tour of Canada was with Alexisonfire. Ian: It's an awesome bill. This is a great line up for Canada and we have a secret announcement we are going to make in January. Aaron: One more band is on the bill. ATP: What are your plans after the UK tour? Aaron: We play Europe until the end of the year, and then we are coming back to Europe in January for some festivals. Then the tour in Canada, and then we come back to Europe in the summer for festivals. Ian: I don't think we are coming here in January, just European countries. We might do, we are just literally finding out dates. Ian: In the spring, but there could be dates as early as January. Aaron: We are going to come back for some sort of festival but as far as a tour, we don't know yet. Ian: There will be another headline tour with this album. Billy Talent III is out now on Atlantic Records.